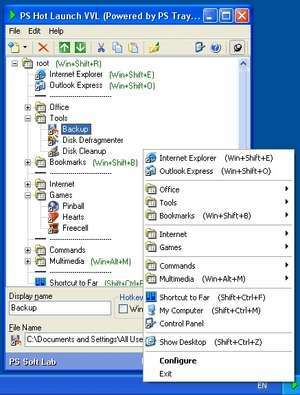 The above operations are carried out through the menu that can be called by clicking the program icon in the taskbar system tray, and also by pressing user assigned hot keys (support for the key significantly extends the number of possible combinations). PS Hot Launch VVL 1.1 is a shareware program and can be used as a demo to try the software until the free trial period has ended. A full version of the program is available after the trial period ends. For security reasons, you should also check out the PS Hot Launch VVL download at LO4D.com which includes virus and malware tests. Additional screenshots of this application download may be available, too.